It's Been A Rough Week for Former FBI Director James Comey, But At Least He Got Some Cookies A 9-year-old who lives in Comey's neighborhood dropped off the treats earlier this week, after she saw reporters swarming the former FBI director's house. 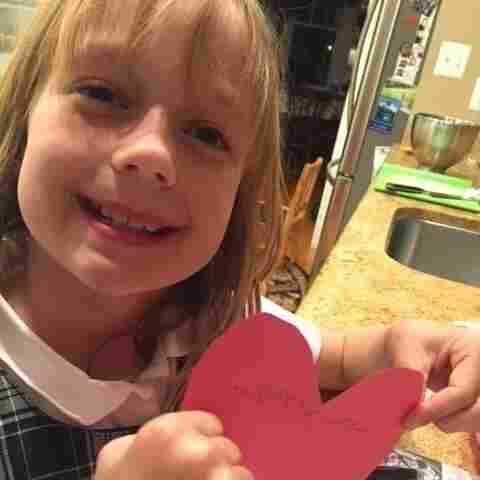 Nine-year-old Abby Grace holds up the card she made to go along with the cookies she delivered to former FBI Director James Comey. Yesterday, while I was in NPR's tiny basement booth underneath the briefing room in the West Wing of the White House, I got a text from the mom of one of my son's friends, Abby Grace. They live in northern Virginia. "FBI Director Comey lives in our neighborhood, and, as you would imagine - there were a lot of reporters at the foot of his driveway today. Abby thought that was quite inhospitable. Well - either a 9 year old in a parochial school uniform dress doesn't look very threatening- or the smell of the choc chip cookies was so good that the security detail could smell them from the other side of the gate .... in either case, Abby Grace just hand delivered a dozen cookies fresh from the oven. She walked up, shook the hand of the 6'10" agent, introduced herself, and, hopefully made Director Comey's day a little bit better!" I have no idea whether this family are Democrats or Republicans. In a later text, her mom guessed what might have motivated Abby Grace to pay Comey a visit. 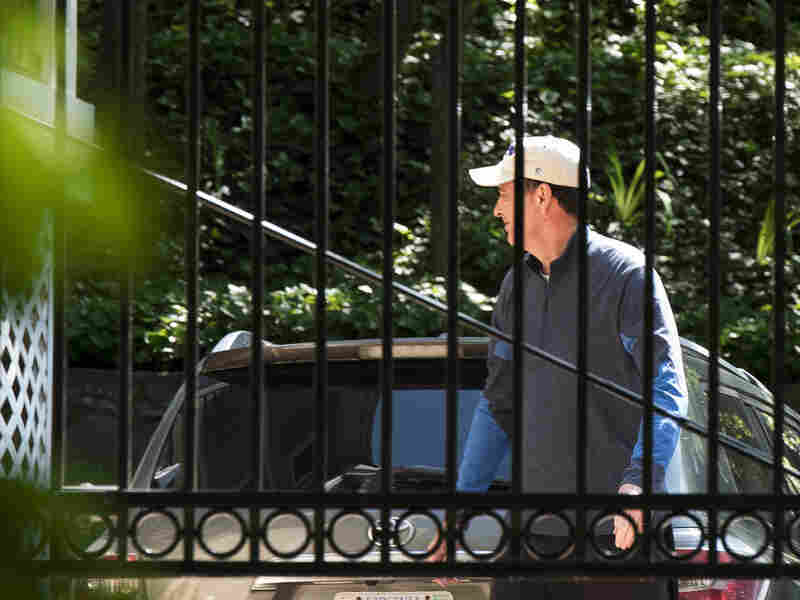 Former FBI Director James Comey walks outside his home in McLean, Va., on Wednesday. "We've spent a lot of time talking about how kindness and empathy are the most important ways for us to engage [with] people regardless of if we agree with or understand their positions," she wrote. "In [Director] Comey's case, Abby said 'I wanted him to know we respect him for his career of service.' "
Just to be clear, that 6-foot-10-inch agent was not the 6-foot-8-inch Comey himself. But according to Abby Grace's mom, Comey really appreciated getting the cookies.